Senior Kaelan Fitzpatrick stands with his brother, freshman Dillon Fitzpatrick, at the Athletics and Events Center. 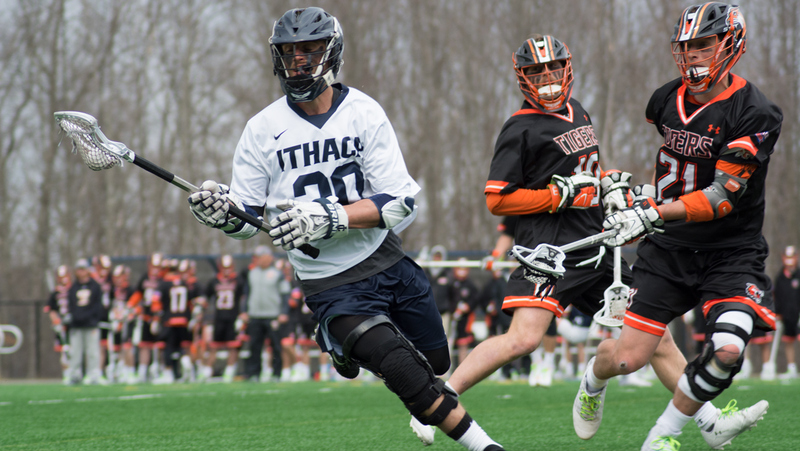 Both brothers play for the Ithaca College men’s lacrosse team this season. Before they traded in their bats for sticks, before they went from hitting the slopes to scoring goals and before they became the first pair of brothers to play for the Ithaca College men’s lacrosse team in over a decade, Dillon and Kaelan Fitzpatrick were just two boys looking for a new sport to try. They were playing Little League Baseball at the time, and lacrosse was still relatively new and unknown in their town of Dover, Massachusetts. But a family friend was a coach in a local youth league, so the brothers decided to give it a try. Now, the two are regular contributors to the men’s lacrosse team. Kaelan, a senior attack, is a regular starter, while Dillon, a freshman midfielder, is picking up significant playing time this season. Head coach Jeff Long said Dillon has been able to adjust nicely to the team and has made key plays for the Bombers. For the two, playing together is nothing new. 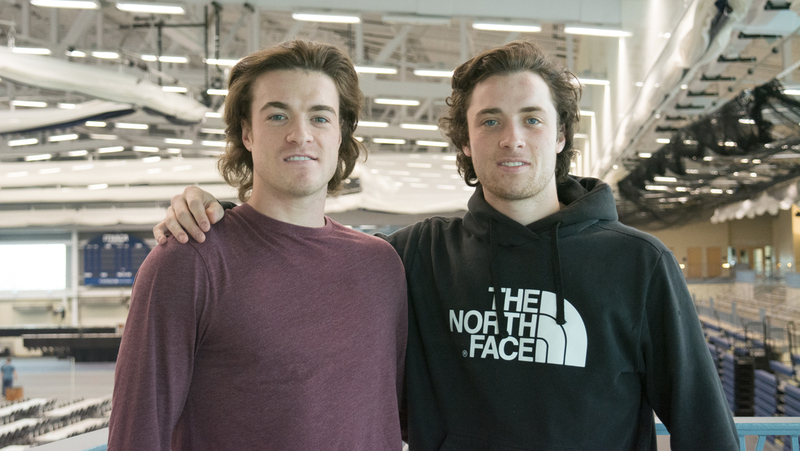 The brothers grew up with skiing as their main sport and competed together on the ski and lacrosse teams at Gould Academy, a boarding school in Maine. It was at boarding school that Kaelan decided he wanted to pursue lacrosse as more than just a way to stay in shape during the skiing off-season. After Kaelan graduated from high school, Dillon transferred to Proctor Academy in New Hampshire. When it came time to look for colleges, Dillon also had to decide between skiing and lacrosse. Ithaca College was on the list as a default. Not only had he been around the team already because of his brother, but also worked closely the former assistant coach, who had coached his summer team and had talked to him about the college. Long said there was no question these two would be fine playing together. For the team, Kaelan said that having his brother on the team has brought everyone closer together. So far this season, Dillon has tallied eight goals and two assists, while Kaelan has five goals and four assists. Kaelan and Dillon play two different positions, although Dillon has had to fill in as an attack at times due to injuries. Since Kaelan is a starter and Dillon is not, they are rarely on the field at the same time. They do, however, overlap occasionally. With two games remaining before the start of the postseason, the pair will likely just have a few more chances to play together. But for Dillon, there’s a chance he’ll be joined by another familiar face in two years. Their younger brother Macklin is currently a junior in high school and considering attending the college and playing for the lacrosse team.